Welcome to my eBay Shop. I sell Accessories. Please add me to your list of favourite sellers and come again. Custom stock CS800 T/hole,Walnut,R/H,standard checkering,adjust.pad.Example. Custom stock CS500 ,Walnut,Right Hand,Forend Plain(shown) or checkered. Example. 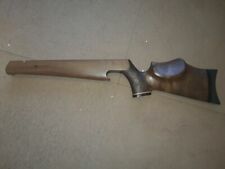 Custom stock CS500 Sporter,Walnut,Left Hand,Forend Plain or checkered, Example.